With Manchester City's Raheem Sterling returning to Anfield this week, following his acrimonious departure from Liverpool last summer, he was right to expect a hostile reaction from the Merseyside crowd. Although Liverpool's followers left him in little doubt what they thought of his perceived treachery, his return still pales in comparison to one of the nastiest reunions in European club football. 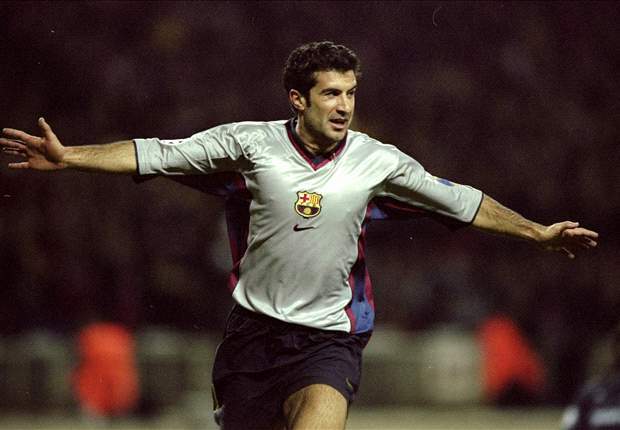 In 2000, then Barcelona winger Luis Figo was considered one of the best players in the world after he followed up a terrific season for his club by leading Portugal to the European Championship's semi-final. Later that year he would be awarded the Ballon d’Or for his efforts, but before being handed that prestigious honour his career would take a very decided turn. After enjoying a wonderful five years with the Catalan side, Figo had become a hero to Barca's fans and was seen as a symbol of the club. 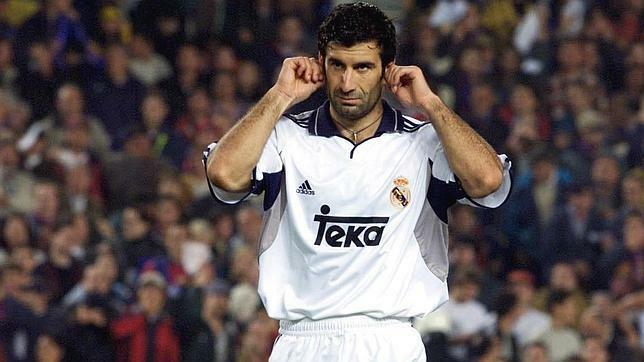 In the summer of 2000 though change was afoot at their great rivals Real Madrid. Despite winning the Champions League in 1998 and 2000, incumbent president Lorenzo Sanz surprisingly lost out to the charismatic Florentino Perez in the the club elections. Perez won the election, in part, because of his bold claim that he would deliver Luis Figo and that a deal with his agent was already in place. Furthermore he promised to refund Madrid's 70,000 plus members for their season tickets if he didn't bring in the Portuguese maestro. True to his word, Perez's first act as president was to pony up Figo's 10 billion peseta (£37.5 million) buyout clause which allowed him to join Madrid on a lucrative salary. 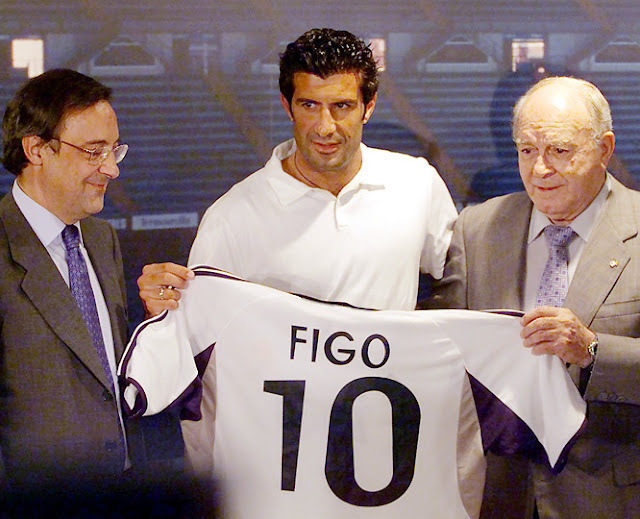 Barcelona were incensed and claimed that Figo had gone against his word and betrayed them, with Barcelona president Joan Gaspart calling the deal "immoral". The fans and local press were also outraged at what they saw as a betrayal by their now former favourite son. 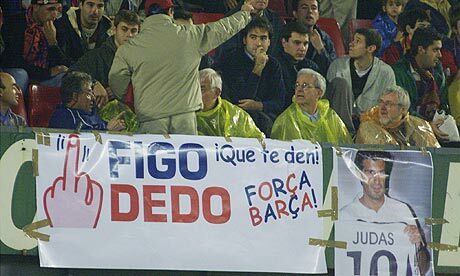 When Figo returned to Camp Nou for the first time with his new side in October 2000, he was showered with debris and vicious insults from many in the partisan 105,000 strong crowd. Many fans later claimed it was the most hostile atmosphere ever dished out at the famous old ground. One banner famously said, "We hate you because we loved you so much", which is emblematic of the feeling of being stabbed in the heart that many of us feel when a former favourite defects to the enemy. Other signs and banners directed towards Figo weren't quite as poetic. Two years later it wasn't any better, as Figo had a pig's head chucked at him while attempting to take a corner at the Camp Nou. Sterling can count himself lucky.